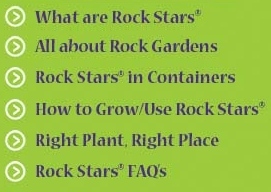 Search the Rock Stars® Plant Database to find the perfect match! Pick one area of your garden, and click various boxes that describe the conditions, especially for sun exposure, soil, USDA hardiness zone and the intended use (for instance, in a container, a scree or a wall). Note that all the criteria you specify must apply to a plant in order to return a result, so the more criteria you select, the fewer plants will be returned. When you're finished, click the "Search" button below. Click here for more detailed help.